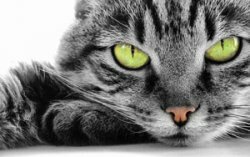 Companion Cats | ACF Inc.
Companion cats may be non-pedigreed cats of indeterminate origin, a cat where one parent is known and the other parent is of indeterminate origin, or a pure-bred cat without a pedigree or a fault that precludes showing in the pedigree section (e.g. a lost or kinked tail). Contrary to popular belief, Companion cats can be shown at a cat show and they have their own standard that is very different from those of their pedigreed relatives. Companion cats should exhibit excellent temperament, a nice purrsonality, and top physical condition as the paramount requirements. They may have any coat colour, eye colour, body shape, or coat length. The only requirement is that the coat and eye colour should complement each other. Cats should be in proportion and well balanced and the overall cat should be visually appealing. Unlike the pedigreed section where a cat must conform to a written standard set by judges and breeders worldwide, the Companion cat has the advantage of only having to appeal to that certain judge on that certain day. At a show, Companion cats are treated just as importantly as the pedigreed cats. Most affiliates give the same trophies, ribbons and rosettes and, in some organisations (although not all), Companion cats can compete for their own titles and awards. All cat-registering bodies throughout Australia encourage the desexing of all Companion (domestic) cats that are not being used for breeding by a registered breeder. All adult Companion cats (cats over nine months of age) must be neutered or spayed. Most affiliates throughout Australia are committed to educating the public about responsible cat ownership and, to this end, they encourage the showing of domestic cats. If you would like to try showing but don't necessarily want a pedigreed cat, you can always try showing in a Companion cat section. You may already have a cat or you may consider adopting one from an animal welfare organisation. A kitten usually takes to showing more readily than an adult. Companion cats are shown in Group 4 (Group 5 in South Australia). This can vary according to the State or Territory in which you reside and we suggest you contact the ACF member body in your State or Territory.